*MANUFACTURER: Unknown, made in Japan is stamped on it. Lens is probably a knockoff. *MEASURES: Bell opening approx. 2 1/2" dia., Thread dia. approx. 1 7/8". *CONDITION: Lenses look good. I could not seen any abnormalities when I looked through it. No scratches or chips. 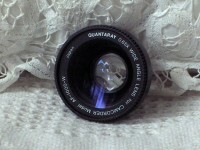 Lens comes in a lens container and has always been kept in one. Lens body looks good also. Threads were looked at with a magnifying glass and appear not to be stripped. *A picture of the threaded side will be sent upon request.